Our collection of handcraft tables and benches could be a perfect focal point for your home decor indoors or on the porch. More than 10 years ago Sparky Potter designed and crafted the original Rainbow Trout table. 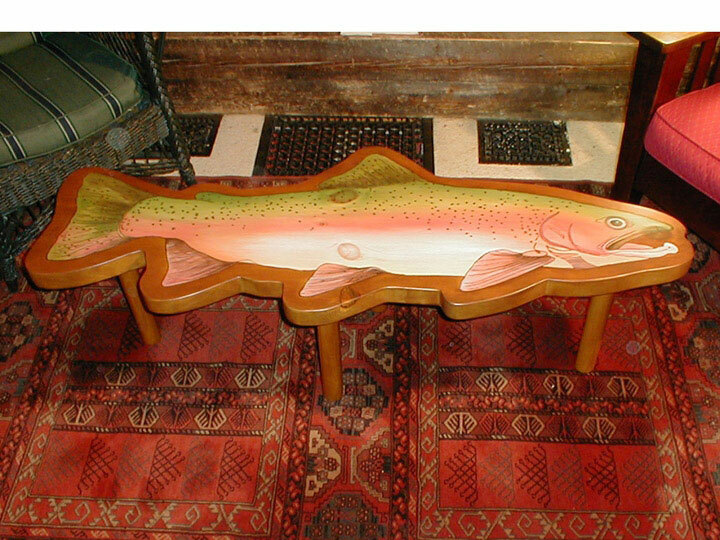 One of these first trout tables was purchased by a friend from England, whose wife was royalty. Wood & Wood shipped the table to them and shortly after received a note that they had tea with the Queen of England at our table. Apparently the Queen was an avid fly fisher, and loved the trout table. Recently Wood & Wood’s Fresh Water & Ocean Collection of fish coffee tables were a feature story on WCAX Made In Vermont, the Burlington, VT, CBS-TV affiliate. 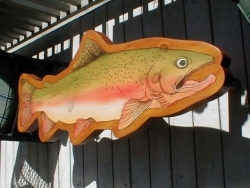 The featured forty pound Rainbow Trout, Bluefish, Striped Bass and Lobster are all milled locally and crafted from 2-1/2″ thick pine or hemlock slabs. No two are exactly alike; the wood grain and knots that are viewed on the surface distinguish each offering a lot of character to each piece. 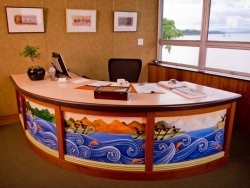 Each fresh water and ocean creature’s outline image is wood burned into the slab then artistically rendered with numerous layers of acrylic washes followed by several varnish coats. 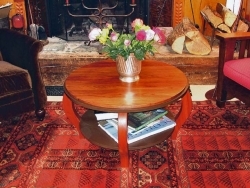 The table base can be black painted metal or 2″ thick wood peg legs, which are strong enough to use as a bench. 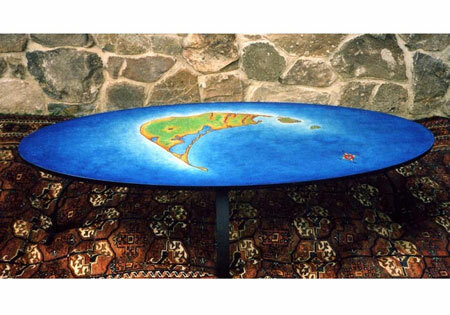 These whimsical custom tables can portray your personal destination. The map theme could display your favorite range of mountains, sailing adventure, golf course or ski outing. 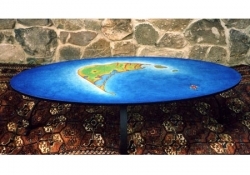 A map table is fabricated from a 3/4″ MDF slab then artistically rendered with numerous layers of acrylic washes to portray the true map image, followed by several varnish coats. With its warm wood tones and inviting “old world” charm this handcrafted table is a cozy fit for any living room. 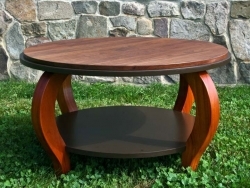 The Hobbit table is fabricated with a dark walnut top and mahogany legs. Wood & Wood also designs and fabricates custom doors, indoor / outdoor furniture, tables, counters, lighting fixtures and one-of-a-kind exterior or interior wood murals. Please call for additional information and portfolio images.